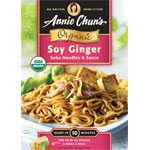 Go HERE to sign up for the Annie Chun's Newsletter and get a $1 Off Annie Chun's Printable Coupon. I love to use Annie Chun's Organic products on a busy night. Their restaurant quality products are quick and easy to make. We usually add veggies and a lean protein to make them even healthier. Our favorite product so far is the Soy Ginger Soba Noodle dish. We even have it on our menu plan this week! If you pair this coupon with a sale, you'll get a great deal on a quick and easy organic asian meal.